Veggie noodles are a healthy alternative to wheat pasta and by adding homemade creamy alfredo sauce, you have a quick meal, loaded with flavour. Who says “fast food” can’t be healthy AND yummy, too. Do you grow your own veggies noodles? You may not think of your standard garden vegetables as veggies noodles when they are growing but after the harvest, many fall vegetables and root crops can be turned into a healthy alternative to dinner with white pasta. All you need is a bit of imagination and a knife, spiral slicer, or a julienne peeler. Most pasta is bland and has no added benefits. Some pasta found in the grocery stores say they contain vegetables like spinach or tomato, but don’t be fooled by their enticing colour. Most of these are just regular pasta made with a bit of vegetable added, often in powder or puree form, to give it colour. There is no added nutritional value. 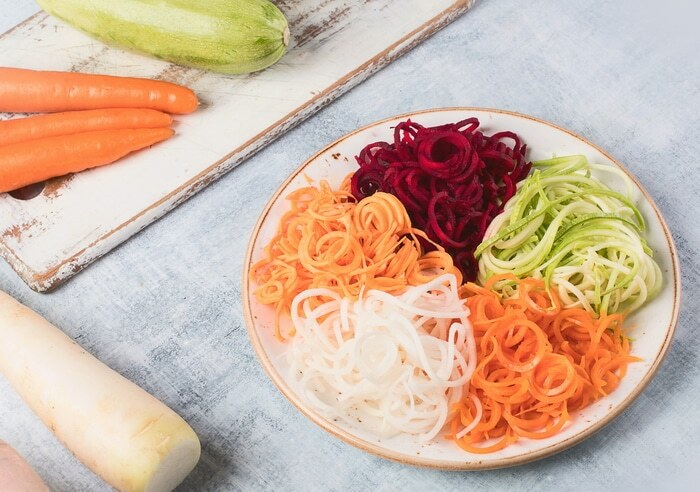 Why not make your healthy veggie noodles fun by adding a rainbow of colour by using beets, carrots, butternut squash, radish or sweet potatoes. What’s so great about veggie noodles? 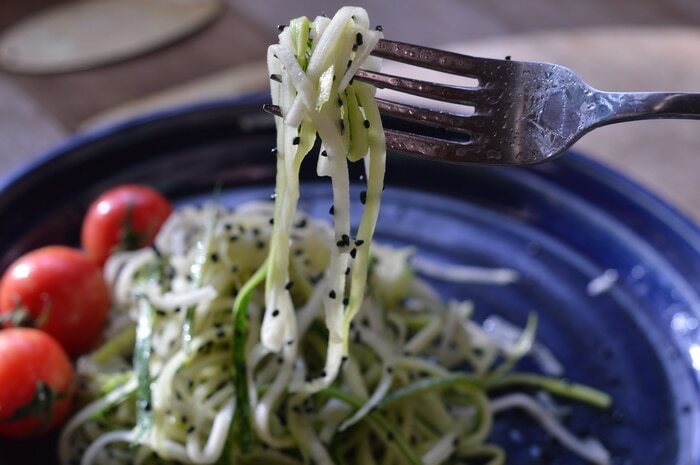 Vegetable noodles are a healthier choice than white pasta. 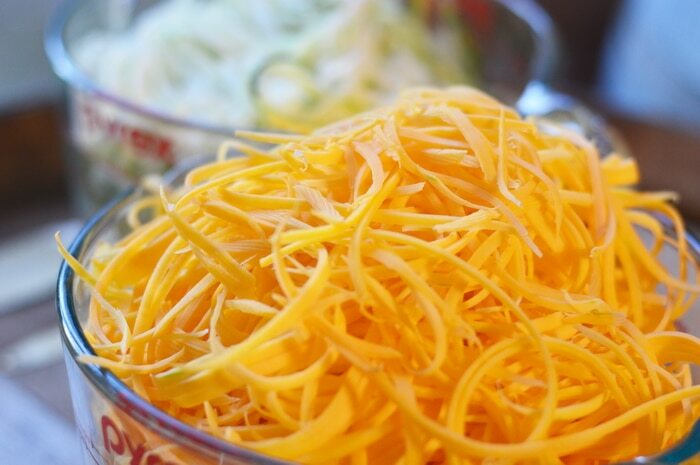 Eating vegetable noodles also helps you increase the vegetables in your diet. Making vegetable noodles is faster than making pasta. Get some green (or red, yellow, orange) into your diet. Veggie noodles have antioxidant properties. Prepare veggie noodles and stir-fry until limp. In the meantime prepare alfredo sauce from scratch. Stir fry the onion in the coconut oil until limp and translucent. Add the tapioca starch to the frying pan and brown lightly. Pour in the coconut milk while whisking to prevent lumps forming. Use an immersion blender to puree the onions and make the sauce smooth. Once the sauce is smooth, add the grated nutmeg and continue whisking until sauce is heated through. Lightly stir fry veggie noodles until limp but still firm. Pour alfredo sauce over veggie noodles to serve. Top with freshly grated gouda or mizithra cheese. A quick Alfredo sauce that blends well with homemade veggie noodles. Lightly stir fry veggie noodles until limp but still firm. 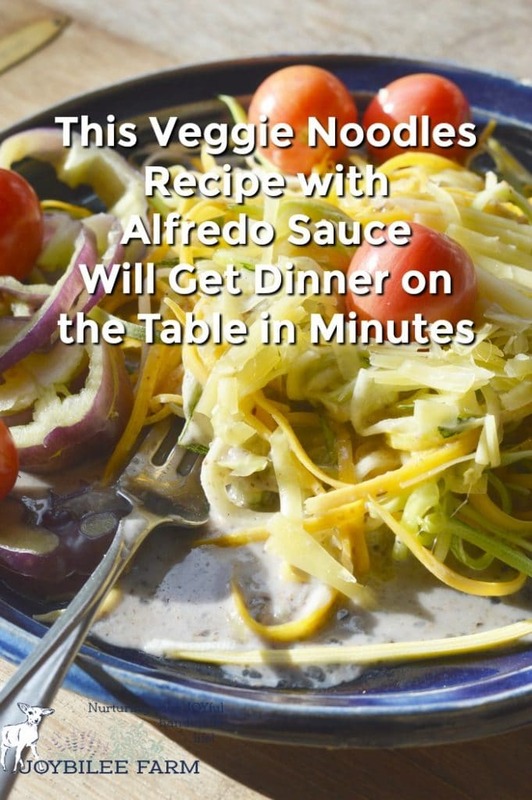 Pour alfredo sauce over veggie noodles to serve. Top with freshly grated gouda or mizithra cheese. 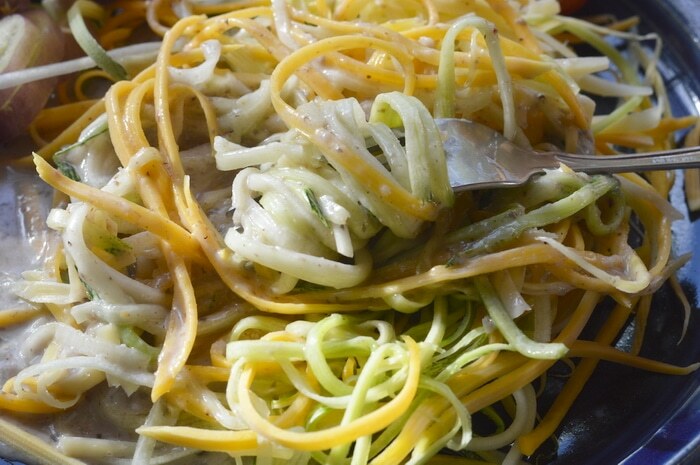 The best thing about zucchini noodles, butternut squash noodles, or other veggie noodles is not the low calories or the high vitamin and mineral profile, but the convenience. Armed with a julienne peeler, a hand operated spiralizer or even just a knife, you can have this dinner on the table in just a few minutes. Any way you would cook up wheat pasta can be used with veggie pasta. Try it topped with marinara sauce, tomato sauce or classic buttered poppy seeds.